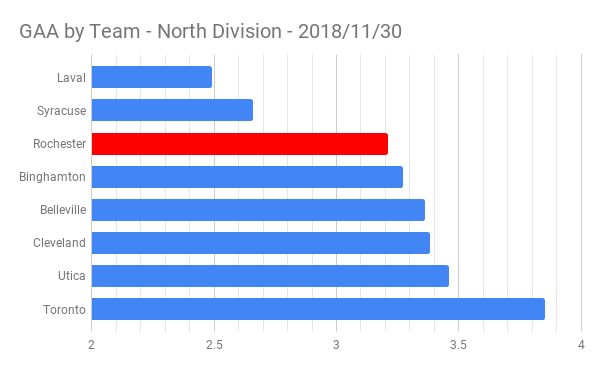 A Look at the First Quarter of the Amerks Season · Let's Go Amerks! The Rochester Americans enter the second quarter of the season sitting in first place in the North Division, a spot they’ve been in since the fifth game of the season. They host the Atlantic Division Wilkes-Barre/Scranton Penguins and will have to play without defenseman Lawrence Pilut who was called up on Tuesday and Matt Tennyson who was called up this morning. The key to the Amerks winning is a fast start and playing a full game. They’ve had two consecutive weekends of playing .500 hockey and in order to stay on top they need to get back to winning weekends. Here’s a quick look at the first 19 games of the season and where the Amerks are as a team. Prospects are finally prospects – Lawrence Pilut, CJ Smith, Victor Olofsson, Alex Nylander, Will Borgen, and Sean Malone are legit NHL prospects. For years we’ve had mediocre players built on very little but hype. Pilut is an NHL player that’ll have limited time in Rochester. CJ Smith is an injury away from getting a look as a complete player with a two-way game. Victor Olofsson has a lethal shot and even though he’s appeared to cool off from the start of the season the potential has been seen. Alex Nylander has been a polarizing player for two seasons but has started to emerge as a true prospect as he’s grown into his body. Will Borgen may have the toughest road ahead as a true defensive defenseman but he plays a reliable game on the blue line and looks like he belongs. Sean Malone brings stability to the lineup with his work on face-offs, his defensive game, and hard work. The biggest question mark at the start of the season is Brendan Guhle. Rasmus Asplund is a prospect but the lack of point production keeps him off that list of a prospect being a legit prospect. He’s contributing in way such as face-off wins and wall play but needs the points to move up. Justin Bailey had a slow start to the season but has been playing better and using his speed to produce points. Danny O’Regan is second on the team with seven goals and has been making an impact in a quiet way. Inconsistent play is a concern for everyone. Whether it’s not starting a game off on the right foot, taking a period off, or various players going through five to six game stretches without any big contributions. Kevin Porter and Wayne Simpson have been two reliable AHL players that have been consistent with their play and point production. CJ Smith has benefited from being paired with them on the top line. The one thing that really lacks on the depth charts is a number one center that’s a threat to other teams. Everyone contributes in small ways but there isn’t anyone that has really taken things over the top. Zach Redmond has 13 goals in 19 games and is on pace for 52 goals which would break American League records as a defenseman. Stats based on pace often start to lose their luster as a season progresses but Redmond hasn’t shown any signs of slowing down. A mix of six power play goals and seven goals playing five on five is sign that his goal scoring is legit. He also leads the league with six game winning goals. Lawrence Pilut is also pushing league record paces with the potential for 76 assists. His future in Rochester will likely be limited with injuries in Buffalo but when he is here he makes everyone better around him. If you haven’t seen him play in a game you’re missing out. The team has been sitting in first place since the start of the season but the last five games raises some questions. The last five games they’ve gone 2-2-1, a stretch that started with the 9-4 loss. Prior to that a 12 game stretch where they went 10-1-1 is what has kept them in first place. Was that 12 game stretch a fluke? Are the last five games just a simple rut? There’s only six points that separates first and sixth place in the division. Syracuse is only three points back and is on a 9-0-1-0 stretch and catching up quick. The team has stated the goal of the season is to be an elite team, how will they improve over the second quarter of the season? Taylor Fedun being traded is a move that may come back to haunt the organization. Injuries are bound to happen and players going up to Buffalo, see Lawrence Pilut, is a a guarantee. In six games played Jack Dougherty has played well in the last four games. Brendan Guhle has not played well in 17 games. The loss of Fedun without anything in immediate return is questionable, a move that won’t really be known until the end of the season. Nathan Paetsch hasn’t played a game yet this season. The coaching staff says he’ll get a chance to play in a lot of games. He says he’s just waiting for his turn. He appears fine with his role as a mentor and eighth or ninth defenseman on the charts but we’ll be left to wonder if the team isn’t missing out on playing a Calder Cup winning reliable defenseman. Matt Tennyson was called up today which leaves Paetsch as the only extra defenseman so there’s finally a chance for him to play. That also shows how the Fedun trade could result in depth issues down the road. Syracuse is clearly leading the way which explains their recent run of 9-0-1-0. There’s always more behind these numbers but it’s a starting point. Scott Wedgewood was signed on the first day of free agency making him a top goaltending prospect. Has he been worth it? He’ll need to improve to prove it. Out of 19 games there’s only been one game that comes to mind where the goalie helped steal a win and that was from Adam Wilcox. He made a number of remarkable saves on November 18 vs Hartford to keep the team in the game on the way to a third period comeback win. The team was down 3-1 in the third and won 4-3. Is Wilcox playing too much? Is it more of an issue that Wedgewood hasn’t had the defense in front of him? Questions that will be better answered by mid January. The Amerks added toughness over the summer by adding Tyler Randell and Yannick Veilleux. They also brought back Dalton Smith. All three players have played well so far and shown the value that they bring when they do play. So far Dalton Smith has been the leader and showing his value. He’s skating well, making plays, and as necessary throwing punches and preventing other teams from pushing the Amerks around. Being pushed around hasn’t happened this season. There’s only been one injury this season that has really had an impact on the lineup and that’s related to Kyle Criscuolo. He’s been out of the lineup since October when he blocked a shot and has now missed 10 games prior to tonight. They were winning games without him but when they’re losing games they could really use him. His status is considered week to week with a hopeful return in mid December. 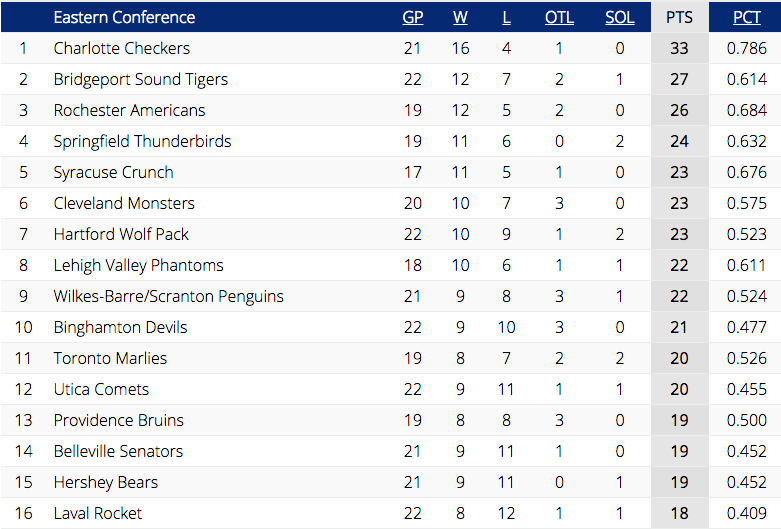 Through 19 games the Amerks have scored 71 goals and given up 62. They’re second in the division behind Toronto in goal scoring and third behind Laval and Syracuse for fewest goals allowed. 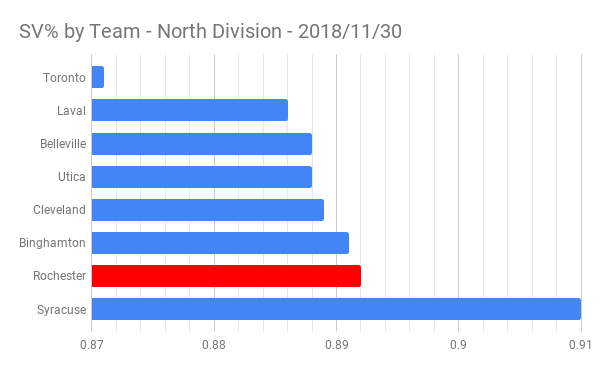 The nine goals scored by Springfield on November 16 really throws those numbers off but it was also the start of the current skid the team is on. Special teams, like everything else, has been inconsistent. 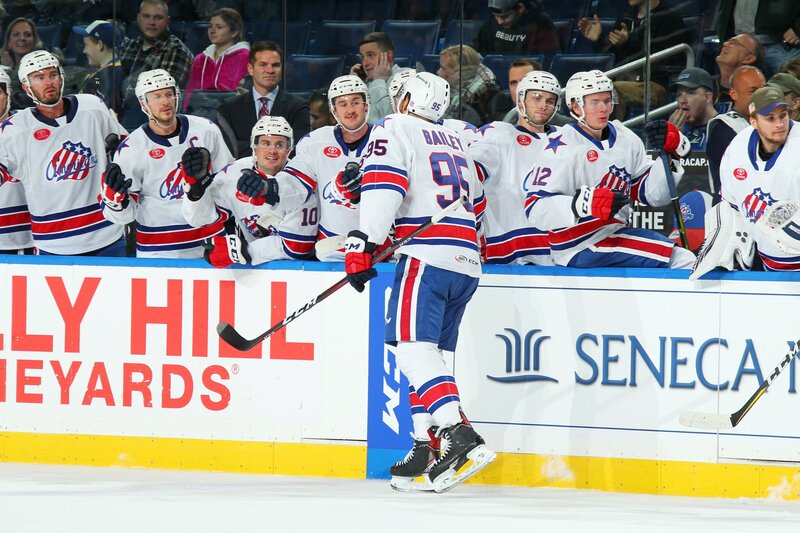 In the first nine games the Amerks had 13 goals on 38 power play opportunities. The last 10 games they’ve only scored three times on 39 power play chances. The penalty kill allowed 10 goals on 38 chances for the opposition in the first nine games. The last 10 games they’ve allowed nine goals on 52 chances for the opposition. That 52 is high after giving up 12 power plays in a game. 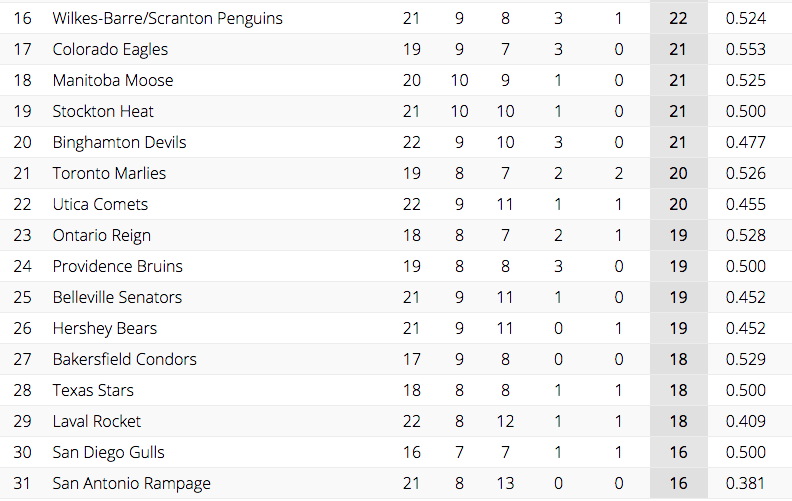 Overall the power play is 13th in the league at 20.8% and the penalty kill is 24th at 78.3%. Increase those numbers and win more games. Overall there’s a lot to like about this team but also a lot to be concerned about. They were winning games with everyone contributing in small ways with blocked shots, scoring chances, hits, and other details like staying onside and crisp passes. They’ve gotten away from those little things in a five game stretch which has given opposing teams an opportunity to catch up instead of widening the gap. 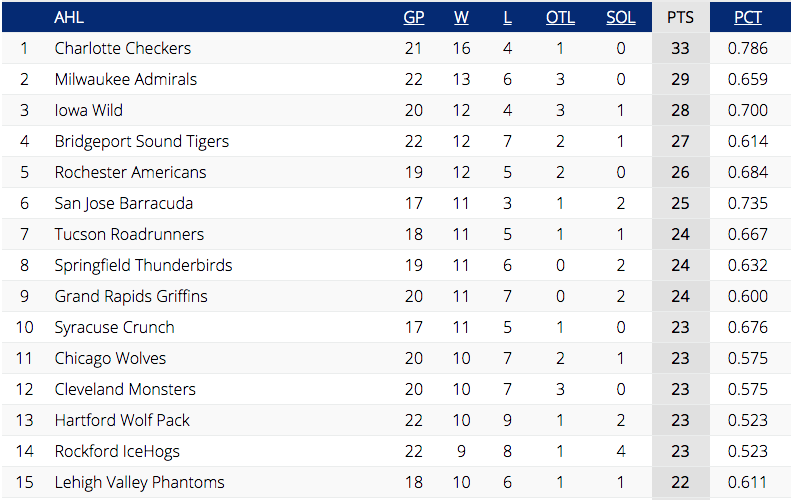 Looking at the overall standings by division, conference, and league the Rochester Americans are at the top. The point differences also show how quick things will be able to change with a winning streak or losing streak by any team. At the current pace they’ll be a playoff team but simply making the playoffs isn’t good enough, this team was built to be a contender. We’re out of the still early in the season stage and entering into the stage of seeing what the team is really capable of.